Invective is an Exotic shotgun that can be acquired after completing its Exotic bounty. The good: Highest base range & stability, regenerating ammo. The bad: Low Impact, low magazine. This weapon causes Solar damage. This weapon regenerates ammo over time. Talk to Ikora Rey to obtain A request from Ikora Part I. Complete a total of 5 strikes without dying to obtain A request from Ikora – Completed. Return to Ikora Rey to obtain A request from Ikora Part II. Earn a Kills/Death spread of 25 in the Crucible (cumulative, not in a single match) to obtain A request from Ikora II – Completed. Return to Ikora Rey to obtain A request from Ikora Part III. Complete a weekly challenge mission to obtain A Clot of Darkness. Return to Ikora Rey to obtain Invective [Uncharged]. Purchase an Invective component from the Gunsmith for 50 special weapon ammo packs to obtain Invective [Charged]. Return to Ikora Rey to obtain Invective. 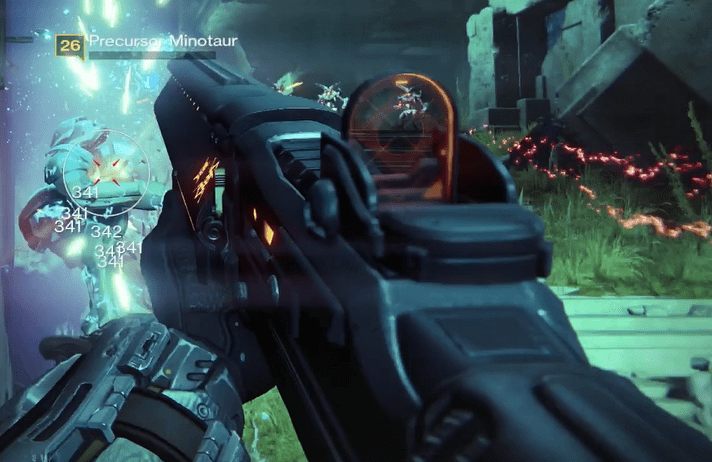 Invective is a special Exotic Shotgun – unlike Universal Remote – that deals Solar damage. This weapon can only be obtained after completing the A Dubious Task Exotic bounty. Invective has seen its role shift since it was introduced months ago. It has gone from a PvP mainstay, to nerf’d obscurity, to a slight resurgence in recent weeks. The shotgun changes introduced in 1.1.1 have given us more to think about when re-evaluating this auto-firing devil in everything Destiny has to offer. Is it still worth an Exotic slot? We’ll evaluate the arguments for and against it. As always, we’ll take a look at the statistics that Invective brings to the table. It has a few strengths that immediately stand out. Its base RoF is well above average for shotgun variants. Keep in mind this does not factor in its Full Auto, which boosts the stat to even higher levels. Its base stability is also a main draw, practically best-in-class, beating out nearly all popular alternatives. To sweeten the deal further, its base range of is also staggeringly high. Unfortunately it doesn’t have Shot Package or Rangefinder though, so its Range is still limited in that regard. To round out its stat profile, Invective’s reload speed ensures you’ll be chambering rounds fast enough to get back in the action – it only takes about 3.5 seconds. It’s worth noting that this speed used to be abysmal, and was buffed substantially in a patch in return for a negligible decrease in rate of fire. When considering its perks, it’s easy to see what makes this weapon an Exotic. Without consuming a perk slot, Invective possesses the innate ability to fire in Full Auto mode, which allows it to pump out deadly DPS, taking advantage of its already substantial fire rate. It also has two reasonable first row choices with Accurized Ballistics and Field Choke. While both increase range and impact, Field Choke can be used for a tad more Range at the cost of a slight penalty to Stability. Usually it’s always best to choose what gives the most range when it comes to shotguns. Its first distinct perk, Final Round, provides a strong kick to the last shot in the clip, which actually pairs well with Invective’s low magazine size of 4. It possesses a couple of useful 3rd row perk options in Fitted Stock and Send It. The former maximizes its Stability potential while the latter gives it top class range. 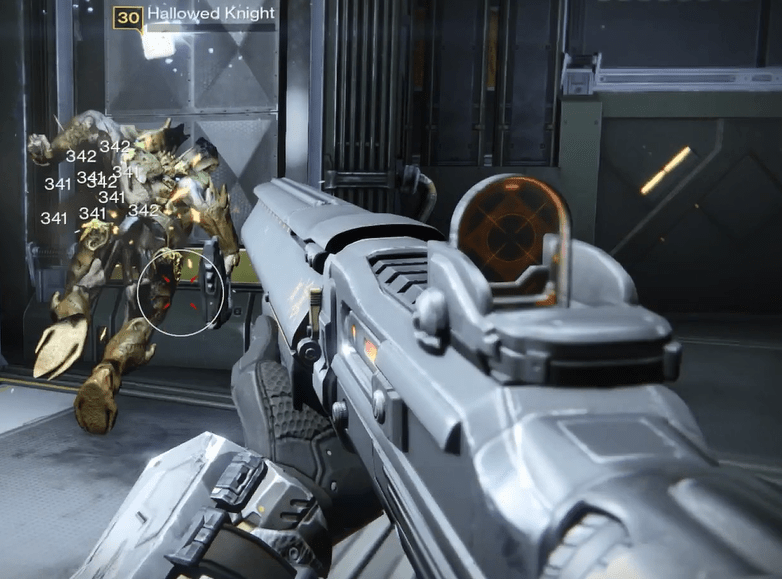 Finally, we are left with Invective’s namesake perk – yes, you guessed it – “Invective.” This semi-unique perk allows Invective to add a full clip of 4 rounds to its reserve ammo every 30 seconds. Though this is possibly a little slow for those who prefer to it as a primary weapon, it’s an undeniable boon in situations in which ammo is scarce. Unlike Ice Breaker, you can pick up ammo too for it, so you’re not limited to the regeneration speed. The base Impact is on the lower end of top-tier shotguns. Found Verdict, Two To the Morgue, Judgment VI, and the peerless Felwinter’s Lie all smirk in its direction. Its Magazine Size of 4 is a little disappointing too, though it undoubtedly leads to more situations in which Final Round comes into play, this is arguably not worth the trade off in sustained fire in prolonged engagements. Fortunately, Invective has one of the most balanced stat profiles of all shotguns, so it can suffer these minor weaknesses without sacrificing its efficacy. While Invective’s perks are solid, there are a couple of odd ones whose usefulness is in question. Linear Compensator is a poor option when compared to Accurized Ballistics/Field Choke. Although it ostensibly creates “more predictable recoil”, it also decreases stability, while adding not nearly as much Range/Impact as the aforementioned options. “Predictable recoil” is not going to be noticeable when firing in full auto, so avoid this one. Similarly, Quickdraw is a nice idea and could be a slight leg-up in Crucible in minimizing swap times, but you’ll appreciate Field Scout much more. As previously mentioned, “Invective” also regenerates ammo slow enough for it to be occasionally frustrating, but this is a minor nitpick. Finally, this shotgun lacks Shot Package or Rangefinder. These two perks are arguably the most crucial for achieving PvP dominance, and even allow PvE users to maintain a healthy distance from dangerous foes while still being able to pull off reliable critical hits. In return, Invective gets regenerating ammo, but this trade-off is seriously dubious when looking at Shotguns at large. Invective has received new life in the form of Patch 1.1.1. While its low Magazine Size and Impact class had previously hampered it from seeing use in PvE content, the indiscriminating 100% damage buff has all but negated these drawbacks. It is now able to reliably mow down Majors, Colossi, and Minotaurs that would otherwise ruin any Guardian’s day. Its stability and range serve it well here too, allowing each shotgun blast to really count. 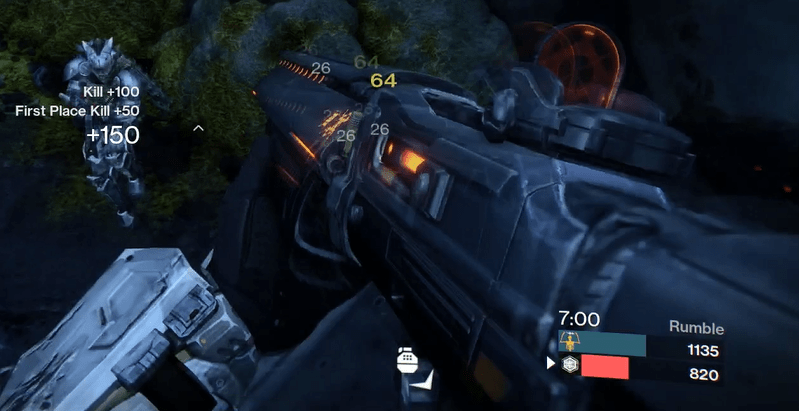 While regenerating ammo might have previously seemed a frustrating perk for a weapon that was outclassed in PvE, it now is a welcome inclusion in Invective’s increasingly impressive resume. Its Solar damage is bit of a mixed bag. While there are a preponderance of Solar-shielded foes, many do not take kindly to Guardians closing to melee distance. Wizards in particular are likely to sting you with a poisonous cloud while floating harmlessly away. With that said, Shanks in Nightfall should beware. With the introduction of Felwinter’s Lie (full review) and the proliferation of Shot Package across vendor weapons, Invective is fighting to remain relevant. Fully automatic fire is an undeniable strength, but if you’re unable to close to the appropriate distance, you will find it hard to take advantage of it. That being said, Invective possesses all the required tools to still be a top-tier threat in the Crucible. With Send It, high range/stability, and regenerating ammo, you can be certain you’ll have a close-range option ready for action at a moment’s notice. Unfortunately, it still demands your Exotic slot. Invective is another example of Exotic done right. It is dark and imposing, with subtle orange accents and a pleasing sight that leaves plenty of visibility when ADS. There are no unnecessary frilly accents or cumbersome spikes, just sleek, compact power. This weapon has waned and waxed with Destiny’s tide. It has gone from being overpowered to under-appreciated, and everywhere in between. Right now, it sits as a fantastic option for those willing to embrace its charms. The combination of very solid base stats, full auto, and regenerating ammo is enough for it to claim “Exotic” status in Crucible and PvE alike. Though it’s not perfect, and while it is always difficult to choose an Exotic over another, Invective will reward you for making the sacrifice. For PvP this weapon earns a 8.9/10 and for PvE a 8.7/10. Next Post:Why Can’t The Crucible Move Forward?